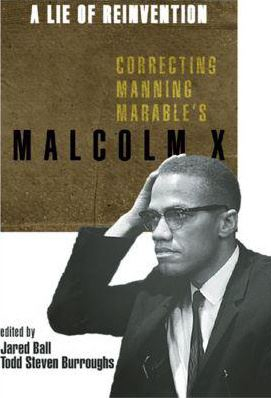 Coming Soon: "A Lie Of Reinvention: Correcting Manning Marable's Malcolm X"
We are publicly arguing about a book because it was a book, The Autobiography of Malcolm X, that intellectually birthed so many Black people in the first place. The Autobiography allowed Malcolm to enter our minds, where he witnessed our rebirths. For many of us, he is still there, advising ever since like some sort of Race Man sensei. As for Manning Marable, his legacy is what it is and will and should be, for good and ill, like every other human on Planet Earth. But, speaking just for myself now, history is more important to me than either any biographer or any biographical subject. (And that includes El-Hajj Malik.) My issue is that this biographical subject deserved a much more thoroughly researched work. Ultimately, the book that Marable wrote can only be countered by another, more definitive book. And so, we humbly offer this book as a collection of notes for that future biography. This book is strongly critical. Good. Harsh public criticism is the appropriate response to harsh public actions, harsh public cultural distortions and harsh public accommodations to the first two. It is also necessary when there are too many, for whatever reason, which refuse to separate critique from tribute. We are unapologetic in our tone because in wasting this grand opportunity, we believe that Manning Marable, our new Ancestor, owes us an apology. And yes, part of this criticism is personal because he personally made decisions, virtually on his own, that produced poor history—one now absorbed by an anti-intellectual popular culture—about a world-historical figure. And that, too, we believe is a reality that should be publicly stated. And as far as speaking ill of the dead is concerned, William Strickland, one of our contributors, reminds us that that idea was “a standard Manning did not adhere to himself.” But even if he did, that would be irrelevant to us. Manning Marable doesn’t need our tribute; others will take care of that. (While this chapter was being written, Columbia University and the Schomburg were moving forward with a Manning Marable Memorial Conference, scheduled for April 2012.) The issue for us is preserving accurate historical memory, and it must be preserved in concrete word and in strong deed. Preserving memory is more important than preserving some sort of intellectual operational unity in deference to Manning Marable’s long history or trying to figure out a way to use, to salvage, what he did with “Reinvention” for the larger Movement. Manning Marable should be remembered—for all his contributions. (And the quality of those contributions are, and will continue to be, argued and debated.) But most of us in this volume, addressing the Malcolm biography and its writer directly—as writers, as part of this tradition of Afro-American critical thought—didn’t go to high school or college with Marable or with his children. We haven’t been taught by him or lectured under him at Columbia. We don’t owe Manning Marable any money. We owe history. We owe Africana Studies. Our larger commitment to historical memory dwarf any concerns about offending Manning Marable’s admirers, colleagues, friends and students. History is our prime concern, and we actively choose not to make shinola or its counterpart out of it. THANKS! We’re obviously very excited!